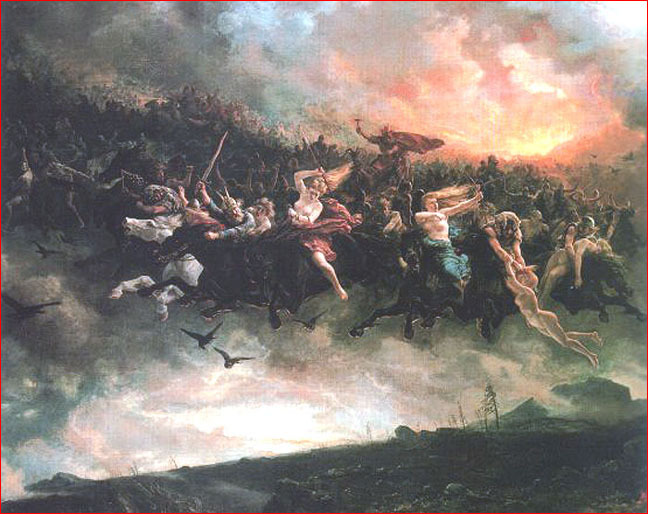 Above “The Wild Hunt of Odin”, by P N Arbo, 1872. After years of ignoring the most pervasive fear in human history, it is time to examine its roots dispassionately. For such a purpose, we need only call upon the appropriate rules for evaluating historical evidence. Let a comet appear in the sky. Let the “zeroes” line up on a calendar. Let the weather turn stormy, or world events grow unsettled. When such things occur they will invariably trigger a cultural response—the “doomsday anxiety”, a fear of the end of the world. Today little attention is given to the historic origins of this cultural syndrome. However, only a few years ago it reared its head at the turn of the millennium. And just two years earlier we saw it with the dramatic appearance of the comet Hale Bopp. Within various religious cults, preachers and gurus and wild men have pointed to imminent apocalypse for as long as any of us can remember. Indeed, the phenomenon may seem too trivial to merit concern. We easily dismiss it as a minor demonstration of the irrational in our species. But the historic nature of the anxiety does deserve attention, for no archaic culture was free from the fear of Doomsday. And most of the collective investment in ritual and magic bore a direct connection to the mythology of overwhelming catastrophe. Early mythic and religious traditions reveal many fears, beliefs, and yearnings shared by all of the early cultures. But while many of the motives are universal, the experiences to which they refer are beyond the ability of accepted science and theory to explain. Science today has no frame of reference for dealing with the collective memories that drove the early cultures. At the end of a 52-year calendar cycle, Aztec priests would anticipate a world-ending conflagration. On seeing that the heavens remained as they were, the people would celebrate the new lease on life. Moreover, the theme of cosmic upheaval appears in New Year’s festivals around the world. Our own Halloween, Christmas, New Year, and May Day celebrations have preserved many fragments. The prototypes for these occasions lay in the remote past, in such celebrations as the Egyptian Sed Festival and the Babylonian Akitu festival, both harking back to events of cosmic chaos and destruction. It is no overstatement to say that ancient nations the world over were obsessed with ideas of world-ending disaster. But here is the heart of the matter, the one fact that can explain the Doomsday anxiety both ancient and modern. Humans everywhere on earth once remembered a world-altering catastrophe, an event of such devastating intensity that it hung like a cloud over every culture for thousands of years. And what they remembered, they expected to happen once more. As before, so again. The world-ending catastrophe remembered by Nordic cultures gave rise to the prophetic vision of Ragnarok, the destruction of the world in a rain of fire and stone. In this vision the great serpent Jormungand rises from the waters of the deep and attacks, spitting its fiery venom upon the world. A battle ensues between gods and giants. Odin’s dark angels, the Valkyries, ride their steeds across the sky, their golden hair streaming behind them. The walls of the heavenly city Asgard fall down, and the celestial bridge of Bifrost dissolves in flames. A much earlier account of universal disaster, preserved by the Greek poet Hesiod, described the “clash of the Titans”. On one side, the leader of the Titans was the god Kronos, original ruler of heaven; on the other, his own son, Zeus. Their war in the sky brought the world to the edge of complete destruction. In such descriptions as these the gods do not just disturb the earth with their thunderbolts, they pound each other with them amid horrific sound, earthquake, raging wind, and a devastating fall of rock. The notion that archaic memories of universal catastrophe were simply exaggerated accounts of local disasters is an unsupportable oversight in specialized cultural study today. Specialists have suggested that the world of the first storytellers was so limited it was “only natural” that they would experience a local flood or a particularly destructive volcanic eruption as a world-ending conflagration. But this gratuitous supposition is contradicted by a cross-cultural coherence. To reconcile human memories and scientific evidence, it is not sufficient to dismiss the ancient witnesses when their testimony is incompatible with today’s “scientific mythology.” The essential requirement is that appropriate ground-rules be followed for assessing cross-cultural evidence. Ancient testimony is both unreliable and useless when individual stories are considered in isolation. No one will ever penetrate to the original human experience by studying a local legend in North America or the South Pacific. But human testimony can be extraordinarily reliable in the hands of one attentive to the points of agreement—particularly where extraordinary and unexpected details are repeated around the world. In its every nuance the Doomsday theme declares that our theoretical assumptions are not correct. But ideology has prevented accredited specialists from following the most obvious question: Does the occurrence in every culture of the same themes and details, which are unnatural in today’s world, indicate an archaic experience of a world with a different nature? Certainly no Egyptologist or Sumerologist could know, based on his specialized learning, whether cosmic violence punctuated the recent history of the solar system. But the supposition of a changeless solar system has kept specialists from comparing data and asking the question. The worldwide Doomsday theme has no roots in familiar natural events. Therefore, we cannot ignore the direct implication: the myths arose as imaginative interpretations of extraordinary occurrences. If mankind’s Doomsday anxiety was provoked by events no longer occurring, the conventional historians’ dismissive approach to the subject must be counted among the greatest theoretical mistakes of modern times.